This Thursday, come join us for our first Mock Trial Club meeting of the semester! All IUP students are welcome to join Mock Trial. It doesn’t matter your major or your year! We have both competing and non-competing positions available! Why should you join Mock Trial? Any questions about the Mock Trial Club can be sent to the president, Holly Kresge, at cznt@iup.edu. 217 Humanities & Social Sciences Bldg. Meet other students who are interested in law school, and help create an agenda for the club. All IUP students are welcome to join the Pre-Law Society, which serves as a valuable resource for those interested in law school and law-related careers. Plus, the Pre-Law Society is a lot of fun. Questions about the Pre-Law Society should be sent to the group’s president, Bucky Wiech at gdnt@iup.edu. SAGE is a feminist club focusing on liberation from gender-based oppression. Our mission is to promote equality in our lives and in our society, and to raise awareness about discrimination based primarily on gender and sexuality. Meetings are held on Wednesdays in McElhaney rm 103 from 3-4pm. 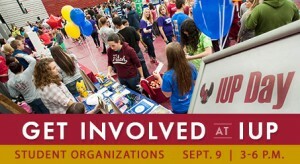 First designed in fall 2007 by IUP alumnus Dijon Cole, IUP Day allows students to explore ways of getting involved at IUP. Chess club is meeting Thursday (2/18) at 7pm in the HUB Conemaugh (all skill levels are welcome). 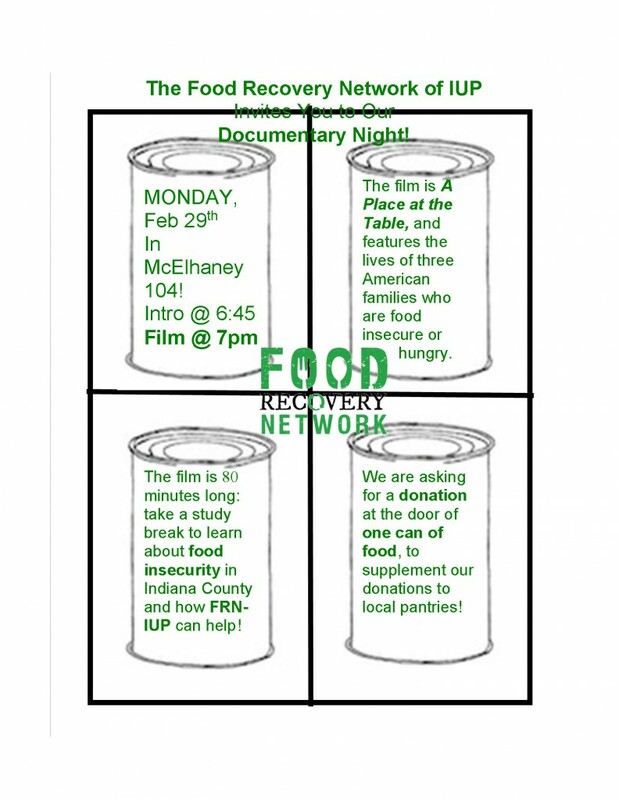 A group focused on community education, The Food Recovery Network explores important political, environmental, and cultural topics surrounding food insecurity, food waste, obesity, poverty, federal nutrition programs, and more in America, as well global climate change. Check out FRN’s group for information on future meetings at https://www.facebook.com/groups/1640429052906397/?ref=bookmarks. There’s another informational meeting October 19th at 6:30pm in the Stapleton Library, downstairs. The Frederick Douglass Institute for Intercultural Research is currently forming 5 teams to compete in the Douglass Debate Society, a debate society that exists across the 14 universities of Pennsylvania’s State System of Higher Education. There are 6-8 slots open for students who would like to represent IUP in the Douglass Debate Society. No debate experience is necessary, but a commitment to working hard to become an effective debater and to compete at the state level is. The IUP teams meet weekly on Tuesdays, 6:30-7:30 pm, to train and practice. Anyone who is interested should email Dr. Watson at veronica.watson@iup.edu for an invitation to joint the first meeting on Sept. 29. Please contact Dr. Watson is you have any questions or would like additional information. SOAR (Students Opting for Drug and Alcohol Responsibility) is always looking for new members and volunteers for events. There are always possibilities for service hours. We meet on Wednesdays at 9PM in Suites on Maple East. There will be a meeting on Friday September, 4th at 8 PM in the Great Hall if you are interested in participating in Chess Club. Please contact Josh Goldin at j.s.goldin@iup.edu if you have questions.